When you go on a holiday, what is the thing that bothers you the most? For me, I definitely don't like the long transit process. When there's no direct flight to a destination, staying over at the airport can help save on costs, but it can also be uncomfortable and tiring. 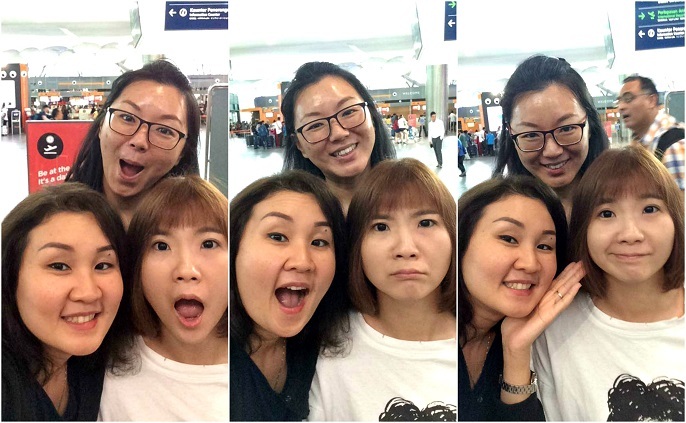 For example, when my besties from Kuching traveled to Taipei in April, they had to transit through Kuala Lumpur before flying to Taipei. They wanted to save money on accommodations, so they chose to sleep in the airport before taking a morning flight to Taipei. Afterward, they regretted that decision because the experience was tiring, uncomfortable, and even painful. Kay and Stella are my besties from Kuching. They slept like a log right after they boarded the plane! After I returned from Taiwan, I researched airport hotels. I stumbled upon HotelPlanner, which is the largest provider of online group hotel bookings and event management services in the world. What I like most about HotelPlanner is that the site is very user-friendly. You can find the right hotel by using search features like location, star rating, price, guest reviews, or amenities. 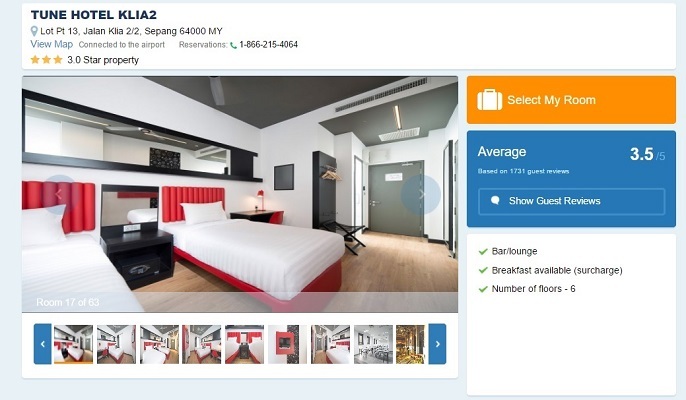 If you're worried about the cost, you can even compare the price with other booking websites. Here are some of the best airport hotels I've found on HotelPlanner. First, let's take a look at the airport hotels located at Kuala Lumpur International Airport, or KLIA2. 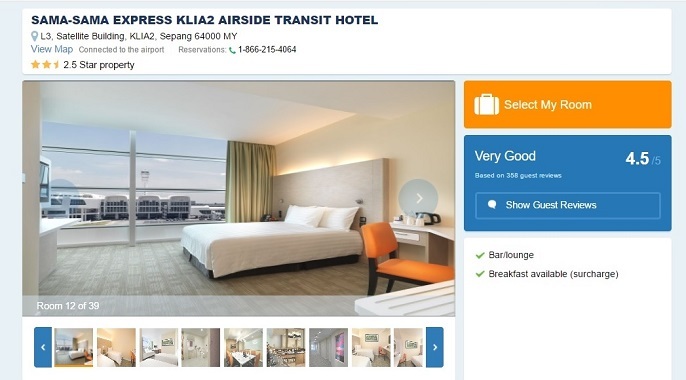 Sama-Sama Express KLIA2 Airside Transit Hotel looks very good, and the rooms look spacious with comfortable beds and clean bathrooms. 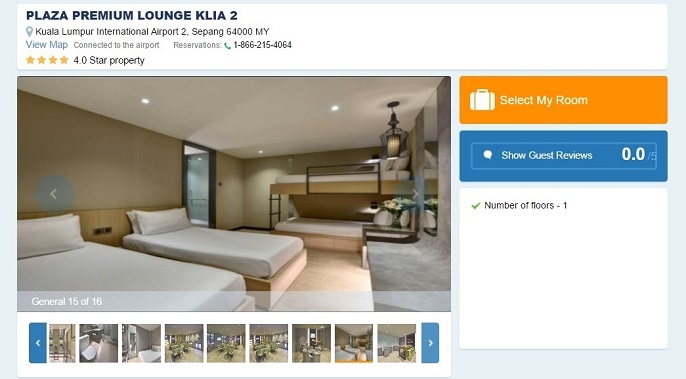 The most important thing is that it's located inside KLIA2, which means you don't need to take any additional transportation from airport to the hotel. The room rate for a six-hour stay is $63, but you can split it with your travel buddy if you aren't traveling alone. The best thing about Plaza Premium Lounge KLIA 2 is that it's connected to the airport. You can book a six-hour suite for $41 or a 10-hour suite for $43. From looking at the pictures provided on the website, it seems that Plaza Premium rooms are only available for solo travelers. The price is also based on one guest. In addition, the lounge provides quite a few amenities, such as breakfast, internet access, newspapers, and in-room bottled water. Tune Hotel KLIA2 is slightly farther away than the other options, as it's about 2.1 miles from KLIA2. There are many types of rooms available at Tune Hotel, so you can find one to meet your needs. If you're looking for a short stay, Tune Hotel has day rooms available for four hours. Breakfast costs an additional $5. Schiphol Amsterdam Airport is the main international airport in the Netherlands and a major transit hub. During my trips to Europe, I've stopped over in Amsterdam before continuing on to London, Frankfurt, or Paris. 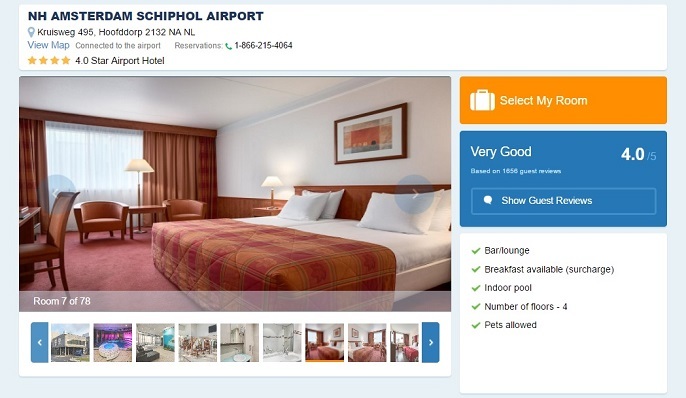 It's no surprise that there are many airport hotels near Schiphol. Citizenm Hotel Amsterdam Airport is one of the closest hotels to Schiphol, other than Hilton Amsterdam Airport Schiphol and Sheraton Amsterdam Airport Hotel & Conference Center. However, Citizenm Hotel is much cheaper than either the Hilton or the Sheraton. Citizenm Hotel offers deluxe double rooms for $140, which you can share with your travel partners. Breakfast costs just $15. This four-star hotel is also near World Fashion Centre, Olympic Stadium, Aalsmeer Flower Auction, and Concertgebouw. 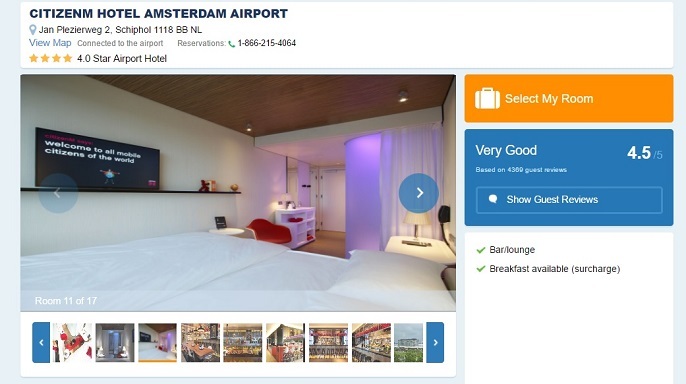 NH Amsterdam Schiphol Airport is a four-star airport hotel. It's located just 2.2 miles from the airport, and the hotel provides an airport shuttle for your convenience. The basic standard room with either one king or two double beds costs only $121 per night. At nearly 200 square feet, the rooms look quite big and even have a separate sitting area. I think the most attractive feature at the NH Amsterdam is the indoor swimming pool. 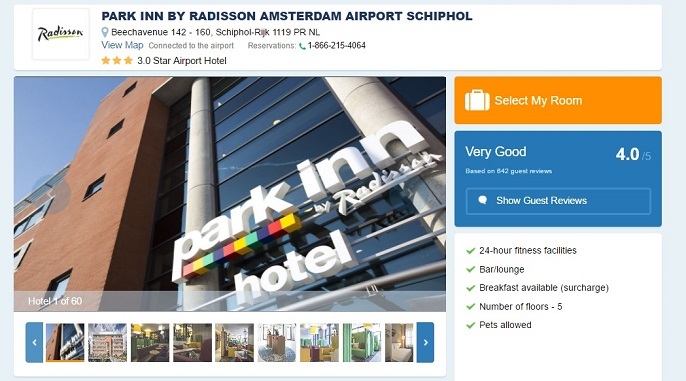 The Park Inn By Radisson Amsterdam Airport Schiphol is another good choice near the airport. This hotel situated among the green surroundings of the Schiphol-Rijk Business Park, and it's only eight minutes from the terminal. The best things about this hotel are the complimentary airport shuttle and the 24-hour fitness facilities. Room rates start at $110 for a standard double or twin room. 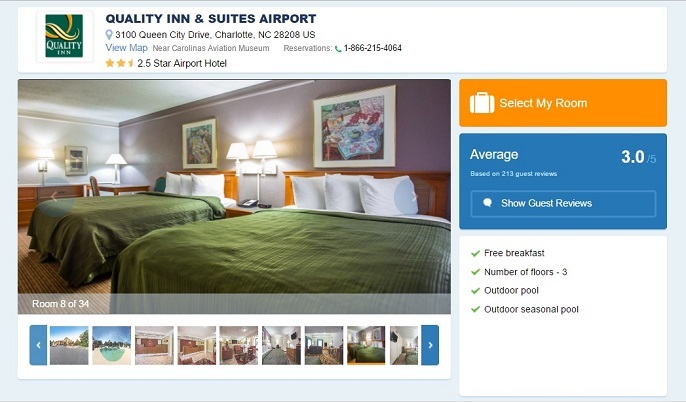 Last but not least, I'd also like to mention the hotels near Charlotte Douglas International Airport. This is a joint civil-military public international airport located in Charlotte, North Carolina, in the United States. 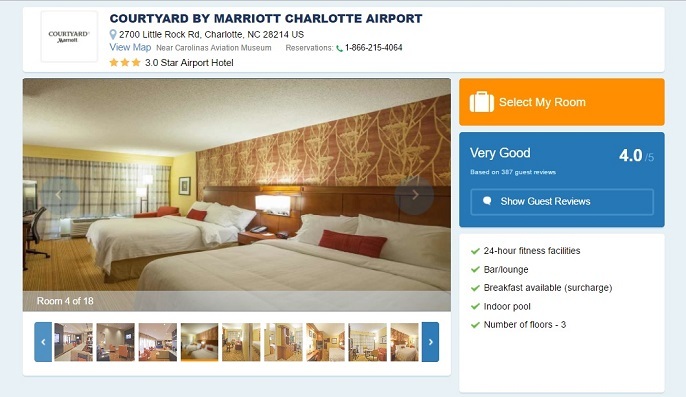 The Courtyard By Marriott Charlotte Airport a three-star hotel that offers complimentary 24-hour airport shuttle service. The hotel is not only near to the airport, but it's also very convenient to attractions like the Carolinas Aviation Museum, the Billy Graham Library, and Bryant Park. If you look at the pictures from the website, the rooms might look a bit old-fashioned. However, this hotel receives good reviews and has comfortable bedrooms and clean bathrooms. The courtyard also provides 24-hour fitness facilities and an indoor swimming pool. 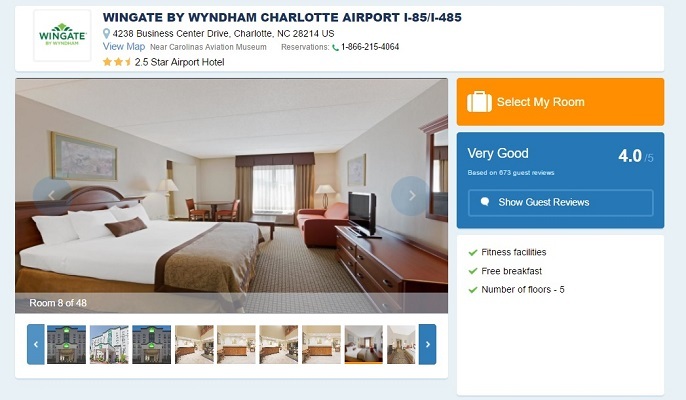 Most of the rooms at the Wingate By Wyndham Charlotte Airport I-85/I-485 cost $93 per night. For the same rate, you can choose rooms with a free hot buffet breakfast, free wireless internet access, and a roll-in shower. The hotel is about 1.5 miles away from the Charlotte Douglas International Airport and provides a complimentary shuttle to the airport, too. If you like outdoor pools, you're going to enjoy your stay at the Quality Inn & Suites Airport. Standard rooms with one king or two double beds cost only $70 per night. Though this is a 2.5-star hotel, previous guests have stated that the hotel has nice, clean, and comfortable rooms, excellent service, and friendly staff members. It's always smart to put money to good use during your holiday. I think traveling should be enjoyable, so researching budget accommodations is a must to guarantee health and stability while traveling. Remember that a fully rested body and an open mind are essential for a vacation.